Fantastic book! I love hearing about history through “the eyes” of the people who lived it! I can’t wait to read his other books! Some interesting information. Very nice to hear the details of what happens behind the scenes. Clint Hill appears to have been a terrible husband and father. He even demonstrated concern when he asked another agent to consult his wife about taking a new role, but never discussed doing this with his own wife. Horrible. I however admire his devotion to the country. Wonderful read about the close-up lives and history in the makling from Presidents Eisenhower thru Ford. Clint Hill witnessed and participated in so much history during that time. His insights into the personalities of the men he served is fascinating. He sacrificed his personal life and suffered a great deal of stress and depression as a result of witnessing the Kennedy assassination. Hill is obviously a man of great integrity and work ethic and I hope he finds peace. I thought it was a very insightful story. I didn't feel like the reading style fit the story, but the history kept my attention. Incredible story of the evolution of the U.S. Secret Service. Just amazing how almost primitive it was in 1958 vs. when Clint Hill left in 1975. Sad to see how such a dedicated man had such difficulty reconciling the demons from the Kennedy assassination. 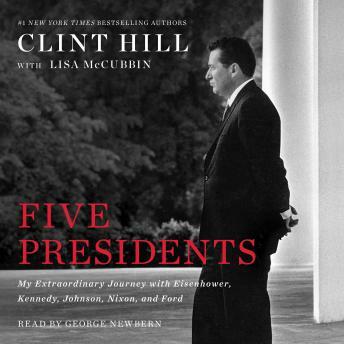 The book was like eavesdropping on pivotal U.S. History with interesting anecdotes as well. Terrific. Fascinating read and insight into the life of a secret service agent. The author does a great job moving the story along so as to not boar the listener. Definitely a must get for any history addicts like myself. It was an extraordinary journey for me too. What an eye opener to see how the men who protect our presidents and their families sacrifice every day. God Bless them all.